There is one cloud variety that is very much sought out by photographers and storm spotters alike. They are the mammatus clouds. But what makes this cloud formation so unique and interesting to many? How did they come into being? Learn more from the succeeding paragraphs. Mammatus clouds are distinct cloud formations hanging down from a cloud base appearing either as smooth or bumpy pouches. The cloud got its name from the Latin word mammatus which means “having breasts” as they bear a resemblance to the breasts of a woman. Mammatus clouds are found in a wide range of cloud genera or types. However, the most striking examples of these clouds occur at the base of anvil clouds that spread on the summit of well-developed cumulonimbus clouds and which extend all over the sky. Mammatus clouds may have either ragged or smooth appearance with sac-like lobes extending from the base of a parent cloud. They may appear from semi-transparent to opaque-colored and often in groups of lobes. The manner in which they are organized vary, from one secluded cluster to a field of mammatus clouds spreading over hundreds of kilometers in similarly-sized or uneven lobes. The average diameter of an individual lobe ranges from 1 to 3 kilometers and a length of 0.5 kilometer. This cloud type lasts for at least 10 minutes to a few hours. Mammatus clouds develop when moist air sinks into dry air due to a powerful downdraft which reverses the normal convective process. As updrafts bring precipitation-enriched air onto the top of the cloud, the upward force is lost and the air starts to spread horizontally, eventually becoming part of the anvil cloud. But because the parcel of moist air is much heavier than the nearby air, it sinks until it reaches the base of the anvil where moisture evaporates. However, the packets of wet air and ice crystals are very large that evaporation cannot take place at the anvil cloud base. These moist air parcels continue to sink farther creating sac-like pouches. The heights at which these clouds are found vary depending on the atmospheric temperature. But more often than not, they develop underneath anvil clouds which are found at elevations between 30,000 and 50,000 feet above the ground. They are made up of ice crystals, water droplets or both. Although they are mostly found under anvil clouds which signify severe thunderstorm, they only emerge after the harsh thunderstorm. However, the strong wind shear present in cumulonimbus clouds makes aviation enthusiasts take notice of mammatus clouds so pilots can stay away from them. Mammatus clouds develop under a wide range parent clouds resulting to different varieties of mammatus such as cirrus mammatus, altocumulus mammatus, altostratus mammatus, stratocumulus mammatus, and cumulonimbus mammatus. Among them, the most common is cumulonimbus mammatus. How common are Mammatus Clouds? These clouds are common all over the United States especially in the eastern and middle states during warm months. 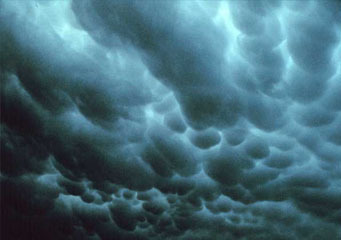 Mammatus clouds may look menacing, but they do not often produce extreme weather conditions. Even so, they are unique and fascinating cloud formations well worth the attention and admiration they get.